What the heck is Grafalloy? This sounds like a made up word to me. The actual material used in this shaft is a Smart-Ply fiber. This Smart-Ply technology is comprised of "six unique cross-linked fiber axes." This is where the graphite comes in. The six fibers take advantage of thin layers of unidirectional graphite to stabilize the shaft along six different axes. What's more is the shaft features the integrated Micro-Mesh technology. This technology is designed specifically to stabilize the clubhead and lessens extra spin. This gives you a more optimal ball flight that is not affected by excess spin. What does all this mean? Longer drives! Bottom line is: when you swing away trying to reach that par 5, the shaft of your club wants to bend (which ultimately steals your hard-earned energy). The Smart-Ply stabilizes the shaft, keeping it from bowing, and thus saving this energy to be transferred into your golf ball. 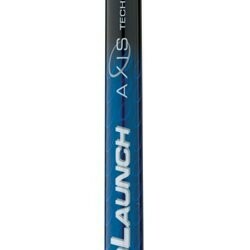 I recommend the ProLaunch Axis Blue shaft for those of you looking for a medium to high launch with medium spin. For a higher launch shaft, check out the Grafalloy ProLaunch Platinum shaft.